A bipartisan budget bill aimed at averting another government shutdown next year passed the Senate by a healthy 64-36 vote and now heads to President Obama’s desk for his signature. The measure, which sets spending levels at just over $1 trillion through 2015, ends a years-long budget stalemate in Congress, where lawmakers have become accustomed to short-term continuing resolutions and fiscal brinksmanship. While the bill was heralded as a break from routine partisan rancor on Capitol Hill, lawmakers are cautious about forecasting a change in the climate there next year. Passage of the budget erases the immediate specter of another government shutdown -- which most Senate Republicans desperately want avoid -- but lawmakers’ focus has already shifted to a different looming fiscal challenge: the debt ceiling. House Budget Committee Chairman Paul Ryan has also said Republicans will want something in exchange for agreeing to lift the government’s borrowing limit. He cited approval of the Keystone oil pipeline as a possible leverage point. Democrats have already begun fundraising off Ryan’s debt-ceiling comments, signaling that these issues will only be enlarged in the coming midterm election year. The budget measure did not address key issues like entitlement reform, increased revenue or tax reform. Still, the bill “breaks through the partisanship and gridlock, and shows that Congress can function when Democrats and Republicans work together to make some compromises for the good of the country,” said Patty Murray, the Senate’s Budget Committee chairwoman who worked with Ryan to forge the deal that also relieves $63 billion in broad automatic spending cuts. Nine Republicans joined all Democrats in supporting the bill: Susan Collins, Orrin Hatch, John Hoeven, Johnny Isakson, John McCain, Rob Portman, Ron Johnson, Lisa Murkowski, and Saxby Chambliss. A dozen Republicans voted with Democrats on Tuesday to proceed with the measure, but several of them opposed its final passage. “I simply couldn't support a budget agreement that trades spending increases today for potential spending cuts years down the road,” said Jeff Flake of Arizona. “We've seen that movie before, and we know how it ends." Republican opposition to the bill centered on the measure’s increase of spending caps originally set through the 2011 Budget Control Act. Additionally, some defense hawks are troubled by some of the bill’s cost-saving mechanisms, mainly a provision that reduces veterans’ pensions. Ranking Budget Committee member Jeff Sessions tried unsuccessfully Tuesday to attach an amendment that would restore those cuts with other offsets. And while the legislation amounts to $23 billion in net deficit reduction, some Republicans said that was not enough, and were concerned it would take place over a decade, while spending will increase in the two years covered. For their part, many Democrats are concerned that the bill does not include a jobless benefits extension for aid that expires at the end of the year. 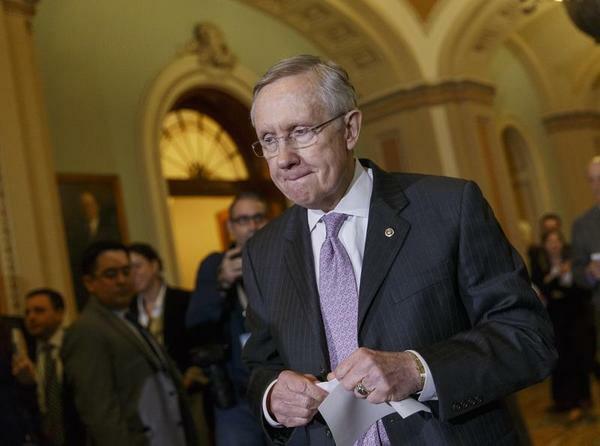 Reid has promised to take up the matter separately when lawmakers return in the New Year, saying the benefits could be applied retroactively. But some Democrats fear that will be too late to do so and saw the budget measure as the appropriate vehicle for the extension.